Emilie Smith knelt on the pavement with her head bowed, as if in prayer, listening while a police officer told her she risks arrest. 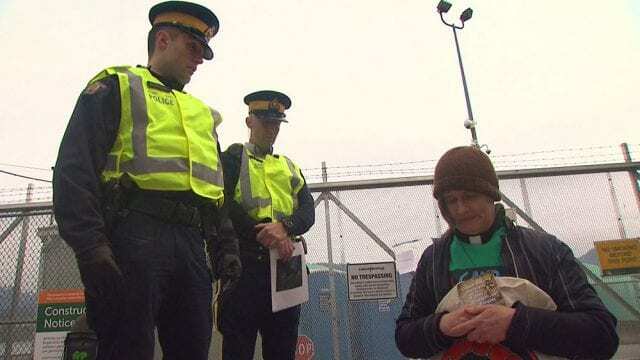 The Anglican priest was among several faith-based leaders blocking the gate to Kinder Morgan’s Westridge Marine Terminal on Friday, defying a court-ordered injunction banning anti-pipeline protesters from standing within five metres of the property. Smith said she was more concerned about the Earth than the consequences of her arrest. “We stand with the First Nations people who have been so harmed by colonialism and by the church and by the state,” said Smith, the sounds of drumming and singing following her to the cruiser parked nearby. She was one of two women peacefully arrested that morning. The gathering of roughly a dozen religious representatives was the latest in a series of anti-pipeline protests, as Prime Minister Justin Trudeau and Alberta Premier Rachel Notley figure out how to forge ahead with the $7.4-billion Trans Mountain pipeline project. If completed, it will triple the flow of diluted bitumen from Edmonton to Burnaby, B.C. Here at the Westridge terminal, Kinder Morgan is planning an expanded dock complex that will be able to accommodate three oil tankers that will be fed from the Burnaby Terminal. Mark MacDonald, the National Indigenous Anglican Bishop, said the project is lacking the free, prior and informed consent of Indigenous people. This is an issue that has been lost in the national and international coverage of the pipeline issue, he said. “This is, we feel, at the heart of reconciliation and at the heart of the UN Declaration of the Rights of Indigenous People and at the heart of a liveable future for all of us,” he said. The project has divided First Nation communities along the pipeline route. While many are camped out on the frontlines of the Burnaby Terminal, Kinder Morgan has said 43 other communities have signed mutual benefit agreements in favour of the deal. A number of other First Nations communities, including Tsleil-Waututh Nation, are still waiting to hear back from the Federal Court of Appeals on a legal challenge. Tsleil-Waututh Chief Reuben George said they will take it to the Supreme Court if the decision does not rule in their favour. “Bottom line: Tsleil-Waututh Nation will do what it takes,” he said. Musqueam First Nation, a small reserve tucked beside the University of British Columbia, backed out of that judicial review process last fall. Councillor Wendy Grant-John said the band council has not signed a deal with Kinder Morgan, but is taking a different approach to a costly legal challenge. 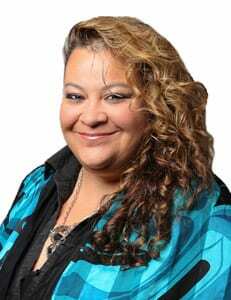 The band council is in the process of negotiating a new framework with the federal government that, according to Grant-John, will aim to better protect the First Nation’s rights and title. Grant-John said she believes this is a better solution to protecting the community’s rights, including land and fishing. “We want to be at the table talking about how we’re going to protect the waterways right out here,” she said. 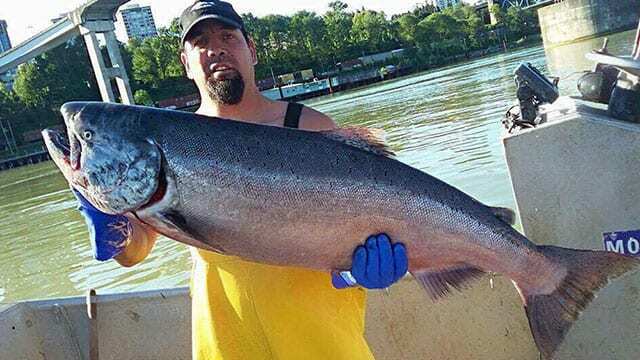 But Mike Sparrow, a commercial fisherman from Musqueam First Nation, said the federal government is “going from chief to chief and they’re dangling carrots.” He thinks the band should take a stance against the Trans Mountain project. “I would never, ever support that pipeline. It has no benefit for us at all,” he said, noting the extra oil tanker traffic that’s expected as a result of the pipeline expansion. While out on his 40-foot-long boat one day, he said he went up to Kinder Morgan’s Burnaby Mountain plant and observed the current tanker traffic. It is great to see religious leaders applying their beliefs to what is essentially a moral question – the battle between the greed and the sustainable existence of life on this planet. Faith without action is dead. Good to see two Mennonite Ministers living out their committment to reconcilliation . Are these people aware that the supreme court ruled to prosecute them as criminals. ‘hope this puts a damper on this nonsense. In the spirit of reconciliation, more faith leaders of all faiths should show their support for Indigenous rights by going to the protest front lines and burn copies of the doctrine of discovery just like they did at Standing Rock. Education is the key. It is estimated that 90 – 95% of people do not know about the doctrine of discovery, that is the root cause of all these protests. Maybe when a person gets arrested why not give the police a copy of this Vatican response pdf statement to educate the police that they are enforcing it as law? No tanker traffic in the Fraser river. Maybe you mean burrard inlet? Maybe pieline spill in the Fraser river?